In recent years the model has been recognised with numerous awards in many international hi-fi magazines and many testers today refer to the device as a “reference”. 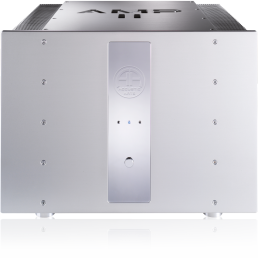 The claim is therefore fully justified that the AMP II is one of the world’s best output amplifiers in its class. The top priority in the development of the AMP II – MK 3 was a perfect signal feed with short distances using the finest components. Some of the components are individually selected as this is the only way to realise the perfect measurement values which form the basis for the breathtakingly beautiful sound of this dynamic amplifier. The AMP II – MK 3 is a so-called “dual-mono power amplifier”, i.e. apart from the common mains cable both channels are completely separated from each other – from the transformer to the output stage board. This ensures the excellent values, for example, for channel separation and signal to noise ratio, etc. The high performance and simultaneously extremely low distortion in the AMP II – MK 2 is achieved using 2 x 1100 VA transformers, a filtering capacity of 160 000 µF, 24 selected MOSFET output transistors and much more. The result of this substantial oversizing is that even when working under high loads the components are never stretched to their limit of performance and therefore ensure the described excellent values. The AMP II – MK 3 works with Class A operation in most applications. And, despite its enormous power, the AMP II – MK 3 reproduces the finest details with extreme precision, in our opinion just as one would expect from a real reference product. The driver stage of the AMP II – MK 3 works on the principle of the current mirror. This circuit principle enables power to be drawn from an existing current. The AMP II – MK 3 is therefore a “power-controlled” output amplifier whereby the large number of MOSFET transistors ensure a very high current capacity without having to stretch the transistors to their performance limit. The AMP II – MK 3 is therefore also suitable for impedance critical or low-ohm loudspeaker systems. Ingenious circuitry removes the need for a servo controller for the “offset” and the quiescent current is generated via the IC or current mirror driver. As a result, direct and alternating current errors (DC and music signal errors) are immediately corrected. This means the total offset is exclusively determined by the quality and symmetry of the used ICs. “High and stable performance level, extremely low distortion, high damping factor, good noise values and band width with extremely high channel separation”. Both output stage channels of the AMP II – MK 3 are equipped with a solid 12 kg heavy high performance heat sink which thanks to its special rib design serves to ensure a constant operating temperature of the MOSFET transistors. Even at full power there is no danger of overheating. An integrated control unit also permanently monitors operating conditions such as DC offset, temperature, clipping and high frequency. If a pre-defined value of one of these points is exceeded, the loudspeakers are immediately switched off to ensure the highest operational safety for the output amplifier and connected loudspeakers. The AMP II – MK 3 is naturally “Handmade in Germany”. All manufacturing processes for this product, from the development through to final assembly, are made in Germany. Test result: “The amplifier is a model of stability and precision while at the same time versatile and agile, making the product a textbook example of how to build an amplifier. Homogeneous, universally usable, virtually perfect. And for this high-end product, an unbelievably reasonable price”. approx. 55 kg / 121 lbs.